While I have never met someone who loves to clean windows, it is not a difficult job to job if you use the right tools and least amount of steps to get the job done properly. There are also many points to focus on: inside windows, inside window sills and ledges, outside windows, outside ledges and window screens. But before you can start any job, you must first have the proper tools in place. 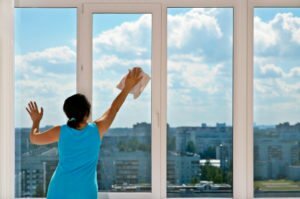 The best time to clean windows is when it is cloudy or the sun is not shining brightly through the windows and drying the cleaning solution too quickly. You also don’t want to clean outside windows on cold days. In addition, you want to clean the dirtiest side of the window first; this is usually the outside windows. Don’t forget to remove any window screen before you begin. After wetting the window, prewash any window that is overly dirty by using a scrubbing wand to loosen any dirt. Soak the entire window again. Using your squeegee, remove all dirt and dirty water. Move your squeegee from the top to the bottom from one side to the other in one continuous motion. After you have removed the initial grime, you can see if you need to wash the window again, this time using the window scraper. If so, wet the window again and begin to scrub using the scraper. Start using the scraper at the edge of the window and work your way back and forth until you have loosened the debris. Continue scrubbing from the top and work your way down using circular motions. After you have removed all debris, wet the window again; squeegee the dirty water off. For a streak free appearance, use a lint-free cleaning towel to dry the window. Use the towel to wipe the sill and ledge. Washing the windows on the inside is basically the same as the outside except for a few minor steps. First of all, move all blinds and curtains out of the way before you begin your window washing. Second, take a broom or a cloth and remove any cobwebs before you apply water; water will not remove cobwebs. 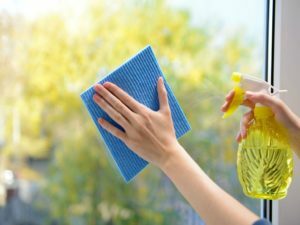 Lastly, if you are not neat when it comes to washing the windows, the may want to place a towel or a plastic table cloth under the window to protect the floor to save you clean up later on. After you have taken these steps, just clean the windows as you did the exterior windows. Don’t forget to wipe the sills and ledges when you are done. Lastly, after you have taken the time to clean the window, make sure your blinds and curtains are clean. If you cover clean windows with dirty window coverings, all the work is for nothing. So, now you have it. That is all the inside information you need to make your windows “picture perfect”.